So, I decided to download the Common Core math standards. As you can see, it is evident the Common Core standards do not dictate Xs and Os in place of numbers. Perhaps a math textbook publisher suggested this strategy, however it is clear after reading the standards this type of writing is not a required instructional approach. As I’ve blogged previously, there’s no such thing as the Common Core police. 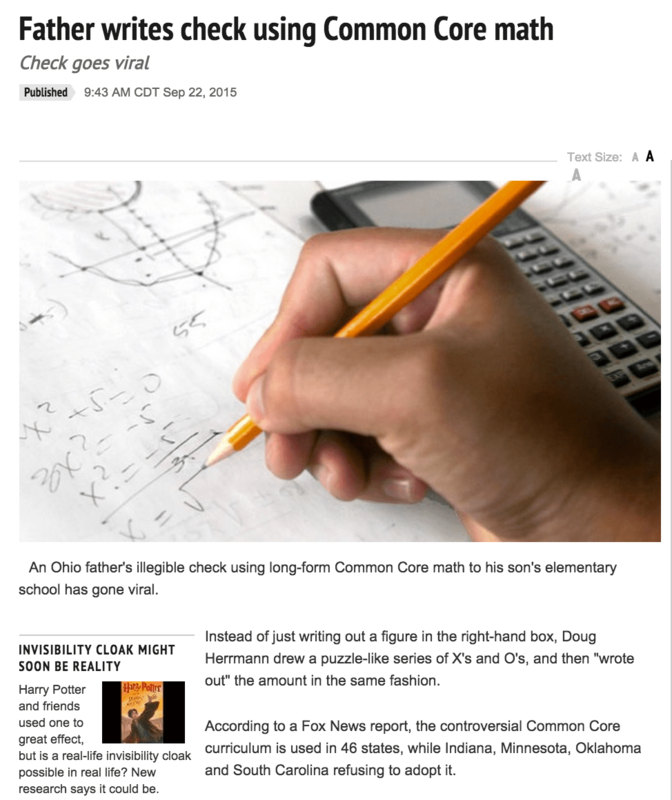 Until educators begin to discern the differences between the intent of the standards and textbook publishers who freely and with absolutely no regulation stamp “Common Core aligned” on their materials, we’ll continue to see more of these types of uninformed news stories. Please consider printing this post to hang in your local teachers’ lounge and/or sharing it with friends on social media. Let’s help each other fact check Common Core news stories! This entry was tagged common core. Bookmark the permalink. Thanks for the explanation. As someone who has grown children, I have not really gotten what everyone means with the common core math. Your explanation makes it a lot clearer now.